Why are mouthguards important, especially for athletes? Each year approximately 15 million Americans suffer from a dental injury, and about one third of those injuries come from participants in exercise or athletic events (Hide, 2011). An athlete has a 1-in-10 chance of suffering a traumatic orofacial injury during athletic competition. These injuries often include contusions, bone fractures, facial and oral lacerations, fractured or knocked-out teeth, concussions, and trauma to the temporomandibular joint (TMJ) (Woodmansey, 1997). Dental injuries can be life changing, permanent, and costly, as an estimated $500,000,000 is spent on emergency dental procedures each year (Dillion, 2000). The National Collegiate Athletic Association (NCAA) requires participants in American football, men’s lacrosse, women’s field hockey, and ice hockey to continually wear a MG (Hide, 2011), which has prevented a predicted 200,000 orofacial injuries in American football each year (Dillion, 2000). Still, MGs are not worn as frequently as professionals would like, and common usage is still not seen in all contact sports. Investing the time to have a custom-made MG fabricated for athletic competition is well-worth the money; it will aid in the prevention of severe orofacial injuries and save a significant amount of money, time, and discomfort from occurring in the future. 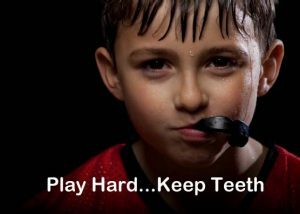 A mouthguard (MG) is a device fabricated for contact sports to absorb forceful impacts or blows that may cause moderate to severe dental and orofacial injuries (Duddy, Weissman, & Lee, 2011). The device is typically composed of a thermoplastic copolymer and is constructed to fit over the occlusion surfaces. MGs are known to prevent oral soft tissue from lacerations, reduce the risk of injury to all surfaces of the teeth, and minimize the risk of mandibular fractures and concussions, due to jaw separation (Boffano et al., 2011) There are three types of MGs available for athletes to use during performance, each offering their own advantages and disadvantages in protection, comfort, and effects on performance. Type I (stock): Placed over the upper dental arch of the athlete without any customized fitting (Guérard, Barou, & Petit, 2017). The improper fit and known bulkiness of type I MGs are rarely compatible with the standards of comfort, ability to speak/breathe, as well as proper positioning and protection. This type is often the cheapest, but is rarely recommended by professionals. Type II (boil-and-bite): This MG is the most commonly used among athletes. The MG is customized to athletes using thermomolding, which increases the temperature of the MG by boiling to enable the material to adapt and form to an athlete’s dental arch (Guérard et al., 2017). While the type II MG provides greater protection that the type I, it still falls short to the exceptional protection of the type III (custom-made) MG fabricated here at Dubuque Dental Associates. Type III (custom-made): Type III fabrication processes begins with either an impression of the upper dental arch or both of the dental arches of the patient (Guérard et al., 2017), which is then made into a plaster replica of the teeth (Woodmansey, 1997). The plastic mouthpiece is then formed using a vacuum-forming technique, and is finally hand trimmed by our doctors to ensure proper fit and comfort. Type III MGs are the most recommended by our doctors, because they provide proper protection without causing any difficulties with speech, breathing, and comfort. Where and how do I get a proper mouthguard? Type II MGs are found at any sporting goods store, ranging from ($1-$30). Each specific brand should have directions on how to properly boil and fit the MG, and they should be located on the packaging or inside. To invest in a custom-made MG, come to Dubuque Dental to start your process. They will get impressions of your dental arches and will use their high-end technology to properly fabricate a comfortable and protective piece. In less than a week, the doctors will have your mouthpiece trimmed and ready for action. Remember, better quality comes with a higher price and proper injury prevention is critical for a high quality of life. Give Dubuque Dental a call today to set up an appointment!